Freddy on his way to his new home in New Jersey. QUEENS — Someone spared him his life from a monstrosity. The runaway cow that made a daring escape from a Jamaica slaughterhouse a day before it was scheduled to be killed has been saved. 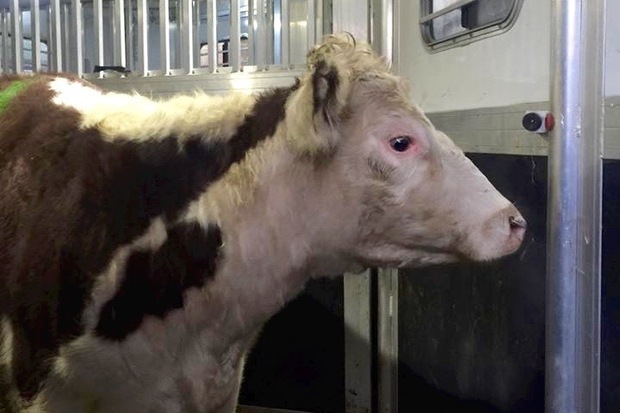 As of Friday morning, "Freddie" the cow was on his way to a New Jersey animal sanctuary, thanks to the persistence of an animal rescue worker who slept overnight outside the slaughterhouse to put the owners under pressure. 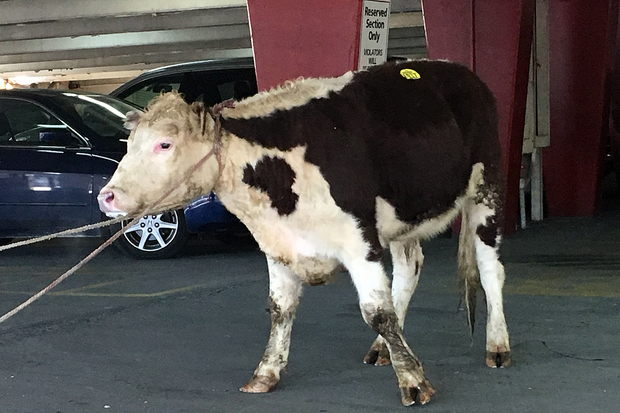 Freddie, who was named after Queen singer Freddie Mercury by his savior because the cow hails from the borough of the same name, fled from Archer Halal Live Poultry on Archer Avenue and 165th Street on Thursday. The bovine escapee clearly took inspiration from his namesake, because he too, wanted to break free. He led police on a chase down Jamaica Avenue before being captured in a parking garage. Slaughterhouse workers told DNAinfo Thursday that they were still planning to kill the cow, yet on Friday morning they turned him over to Mike Stura, 49, of Skylands Animal Sanctuary And Rescue in Wantage, New Jersey. Stura said he called the slaughterhouse immediately after hearing the news, but initially the owners were not willing to let him take Freddie back to the Garden State. Nevertheless, he wouldn't accept that another one would bite the dust, and Stura jumped into his truck and started driving to Jamaica, hoping to convince the owners to let him take the cow. He arrived there at 7 p.m., but the owners were already gone. He waited all night, and when they arrived at work around 7 a.m., he managed to persuade them to free Freddie. “I’ll give him a home and he’ll live a happy life,” Stura said. Stura, who founded his sanctuary about a year ago, said he has already rescued about 75 animals, including sheep, chickens, pigs, turkeys, ducks and geese. “All of them are saved from the food industry,” he said. On Friday morning, Freddie was on his way to a vet where he will undergo a checkup and will get vaccinated, Stura said. On Thursday morning, a goat that ran away from another slaughterhouse in Jamaica was taken to a sanctuary in Suffolk Country, after police officers paid $40 to save it.